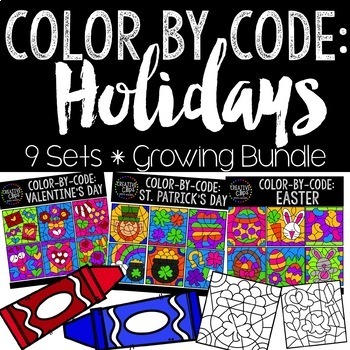 This huge growing bundle will include 108 different Color-By-Code templates (54 color, 54 BW versions) covering nine different holidays! **This bundle currently includes the VALENTINES DAY, ST PATRICK'S DAY, and EASTER, EARTH DAY, HALLOWEEN, THANKSGIVING and BIRTHDAY Bundles. Color-By-Code: Valentine's Day ($4.50 Value) (12 total images: 6 black and white templates, 6 colored versions to be used for answer keys) - Available NOW!!! 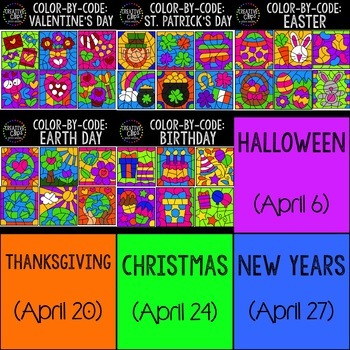 Color-By-Code: St. Patrick's Day ($4.50 Value) (12 total images: 6 black and white templates, 6 colored versions to be used for answer keys) - Available NOW!!! 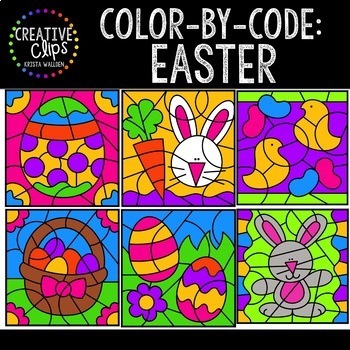 Color-By-Code: Easter ($4.50 Value) (12 total images: 6 black and white templates, 6 colored versions to be used for answer keys) - Available NOW!!! 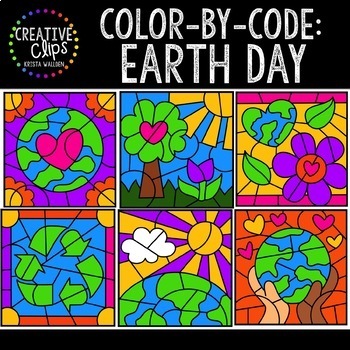 Color-By-Code: Earth Day ($4.50 Value) (12 total images: 6 black and white templates, 6 colored versions to be used for answer keys) - Available NOW!!! Color-By-Code: Birthday ($4.50 Value) (12 total images: 6 black and white templates, 6 colored versions to be used for answer keys) - Available NOW!! Color-By-Code: Halloween ($4.50 Value) (12 total images: 6 black and white templates, 6 colored versions to be used for answer keys) - Available NOW!! Color-By-Code: Thanksgiving ($4.50 Value) (12 total images: 6 black and white templates, 6 colored versions to be used for answer keys) - Available NOW!! Color-By-Code: Christmas ($4.50 Value) (12 total images: 6 black and white templates, 6 colored versions to be used for answer keys) - Available NOW!! Color-By-Code: New Years ($4.50 Value) (12 total images: 6 black and white templates, 6 colored versions to be used for answer keys) - Available NOW!! Each of these sets will be brand new clipart (not previously listed in my store). As the sets are added to this growing bundle, I will be listing them in my store on those dates. However, if you bought the bundle, you won't have to pay full price! If you have any questions about this growing bundle, please ask prior to purchasing! I realize a bundle with this many graphics is an investment and I want you to be completely satisfied with your purchase!